Move over broccoli, cauliflower is the new girl in town! Although both are superfoods and loaded with vitamins, minerals and phytonutrients, cauliflower might be considered the smarter, more sophisticated sister. She is also somewhat of a chameleon, standing in for grain in pizza crust and couscous or as a carbfree mashed ‘potatoes’. Cauliflower can also be pretty flashy, with varieties that are downright out of a Dr. Seuss book in vibrant orange, green and purple. I used white but purple cauliflower would be really striking in this dish. Here is an easy but elegant 20 minute meal which was inspired by a similar recipe from Martha Stewart. It’s beauty is its simplicity which allows each lovely ingredient to shine and, of course, cauliflower is the shining star. 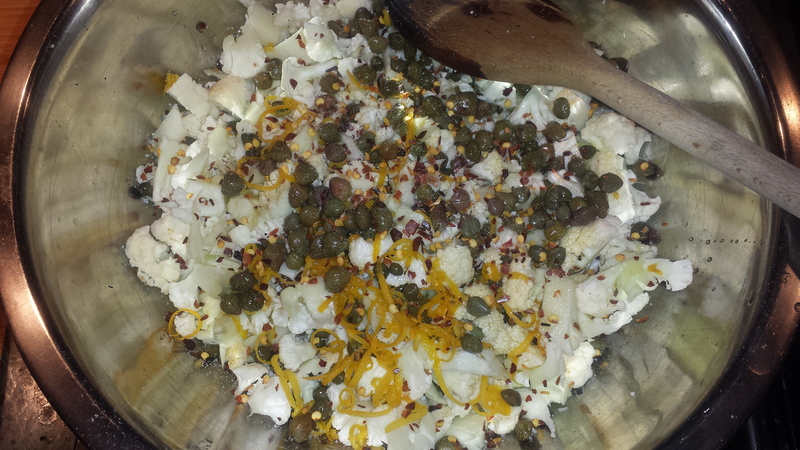 The combination of the roasted cauliflower with salty capers. 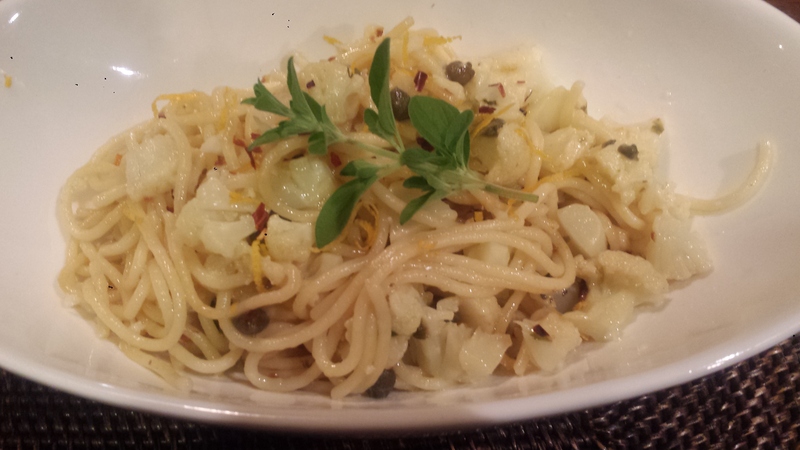 fresh oregano, zesty red pepper flakes and tangy lemon is delicious and satisfying. For cheese lovers, a sprinkle of parmesan pulls all the flavors together. 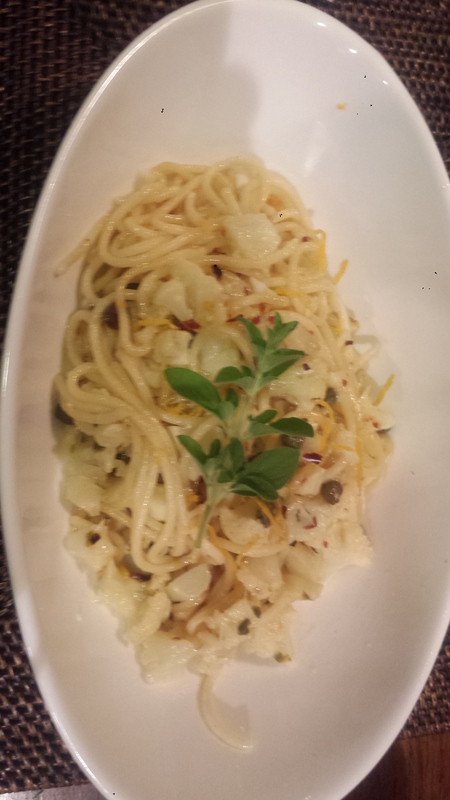 TIPS: This recipe calls for a pan that can go from stovetop to oven, however, if you don’t have a pan that can do both you have two options; cook the pasta then transfer everything to an ovenproof pan OR saute the cauliflower mixture for a few minutes and then stir it into the cooked pasta. For my nutrition and health conscious friends who want to delve deeper into the goodness of cauliflower, here is an article that lists 8 Amazing Health Benefits of Cauliflower including heart and brain health. Surprisingly, it is also a good detoxifyer so don’t be surprised if you see cauliflower start showing up in smoothies… For more cauliflower recipes, check out these grain free recipes: Cauliflower Crust Pizza, Cauliflower ‘Mac’ and Cheese and Tabouleh. For more cauliflower inspirations, here are a few more: Creamy Cauliflower Leek Soup, Dahl Lentil Soup with Quinoa Cauliflower Cakes, Morroccan Style Cauliflower and Roasted Cauliflower and Chickpeas with Tomatoes and Olives. Obviously, I’m a big fan! Cook pasta in salted water for about 8 minutes. Reserve 1 cup pasta water before draining. 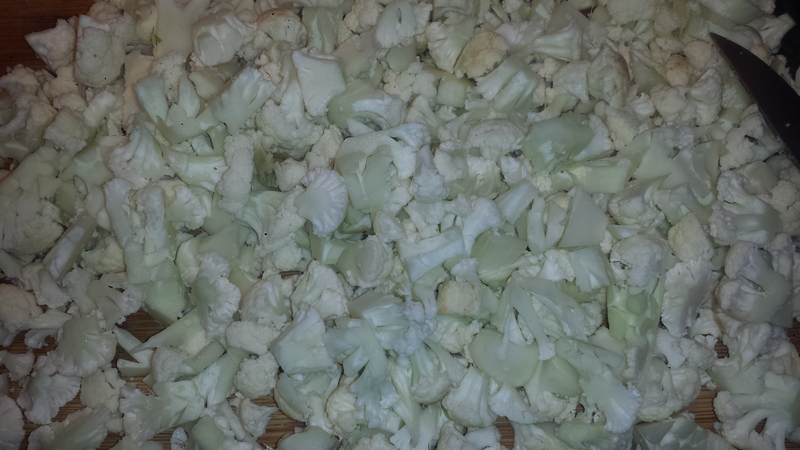 While pasta is cooking, cut cauliflower into small florets. 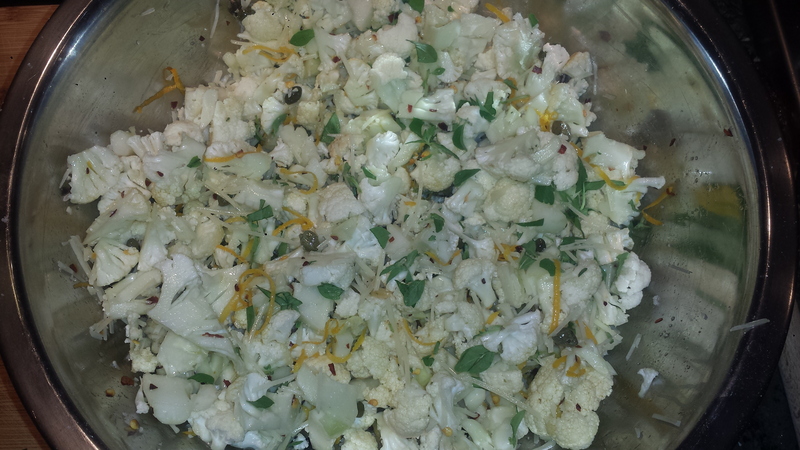 In a bowl, combine cauliflower, olive oil, oregano, red pepper flakes, lemon juice and zest, capers and parmesan. Toss to combine and set aside until pasta is done. 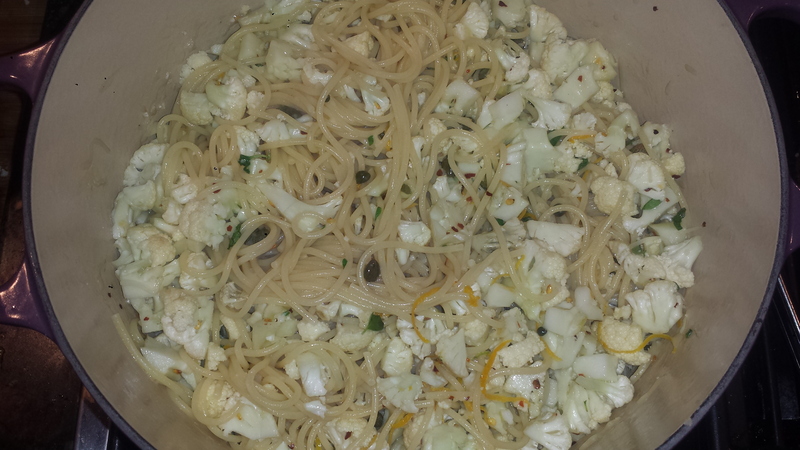 Sprinkle cauliflower mixture over cooked pasta and stir to combine. Add 1/2 cup pasta water. Broil for about 5 minutes or until the cauliflower has spots of golden brown and pasta is heated through. Toss to combine and add more pasta water if it seems dry. Add salt and pepper to taste. 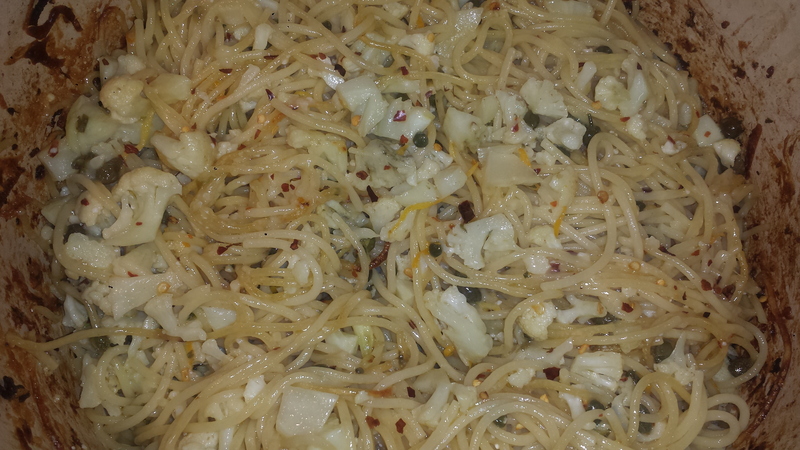 Drizzle with more olive oil, if desired and serve with extra parmesan, if desired. Cook pasta in salted water for about 8 minutes. Reserve 1 cup pasta water before draining. This entry was posted in All Recipes and tagged Cauliflower, cauliflower recipes, purple cauliflower, red pepper flakes, roasted cauliflower. Bookmark the permalink. Oh, so we think alike! I posted a Spaghetti recipe today! This looks tasty!